Terry and Victoria Smith (archived) were sentenced to seven years in prison by a St Charles County, Missouri court for keeping their six year old child with autism in an excrement filled cage. The judge in the case, Ted house also imposed a fine of five hundred dollars on each parent. 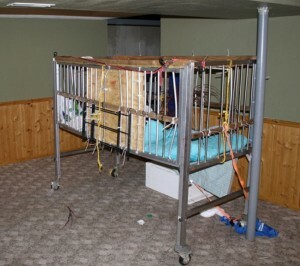 Back in 2010 police, paramedics, and a case worker visited the Smith's home after receiving a tip through a child abuse hotline and found the Smith's autistic son locked in the cage. The seven year sentence is the maximum that could be imposed in this case. Abel Lujan (archived) was sentenced to 48 years in prison for the 1999 murder of Bernadine Frost. Abel Lujan has previous violent felony convictions. The maximum sentence Lujan faced was the same 48 years assigned to him. Danish Syed (archived) was sentenced to 18 months in prison for helping his half brother move to Pakistan. Car salesman Jerry Robbins (archived) was sentenced to 63 months in federal prison after a conviction for money laundering after taking cash from drug dealers and providing them with high end vehicles. Leticia Garcia (archived) was sentenced to 16 years in prison by an Orange County court for molesting a child in her care under the age of 10 between the years of 1991 and 1995. The child's mother walked in on Garcia molesting her daughter and reported the incident to police immediately. Garcia however fled and remained a fugitive until 2011. The victim, her mother, and the victim's sisters gave impact statements to the court about the effect this woman's transgressions against a child she was hired to provide care for. Chrisopher Serna (archived) was sentenced to 50 years in prison by a Florida court for cutting off his girlfriend's head and sticking it on a pole. While Ross Ulbricht faces life in prison and nearly $200,000,000 in restitution, the parents who decided to raise their kids in a cage smaller than a rabbit hutch only owe seven years of their lives and $500 each. Leticia Garcia who was hired to provide childcare and delivered trauma as well as Christopher Serna who actually decapitated his girlfriend and mounted her head on a pike could both reasonably live to an age such that they serve their periods of confinement and enjoy their twilight years outside of prison. On other end of the spectrum Danish Syed is forfeiting a year and a half of prison for acting out of loyalty to a member of his family, and Jerry Robbins is losing five years of his life to incarceration because the particular people who decided to become his customers turned his business of selling cars into money laundering. Right in the middle is Abel Lujan who was convicted of murder and only because of his already advanced aged managed to effectively receive a life sentence. This entry was posted in Bitcoin, Fiat/BTC interfaces, News, North America, The Law. Bookmark the permalink.